The 17-year-old senior from Augusta applied to more than 65 schools and got into about 55 by her count, including Clemson, Oklahoma and Michigan State. Jakelia said the hard work, have taught her that "there is no place too small to be discovered". On Friday afternoon, she made a decision, signing a letter of intent to attend Penn State Beaver on an athletic scholarship. Jakelia, who is set to graduate as valedictorian in May from Lucy Craft Laney High School in Augusta, said she started applying to colleges the summer leading up to her senior year. The teen said she used college admission apps, such as Common App, to send applications to a number of schools because "I had no idea where I was going." Then the acceptance letters started pouring in. "It was very nice," she said in a phone interview with The Washington Post. "It really boosted my self-esteem because I didn't think I would be able to get into that many schools." Jakelia has spent the past four years earning a 4.1 GPA and dominating athletics and other extracurricular activities at her high school. She said she has participated in choir and marching band - as the drum major - math team and high school yearbook. She was a student ambassador and president of the student council and National Honor Society. She played a number of sports - she was captain of the volleyball team and also played basketball, golf, tennis and soccer. And she took honors and Advanced Placement classes, she said. Now she is headed to Pennsylvania to play volleyball. She said she chose Penn State Beaver because "they feel like my second family already." When asked how she found the time to do it all, Jakelia said she learned how to be disciplined and manage her time from her mother, who served in the military. Jakelia said she would use spare moments between classes or games to do homework and fill out college applications. "If you continue to keep pushing, you will succeed," she said. Her mother, Denise Baker, said she encourages Jakelia and her siblings to do their best and live life without regrets. "I'm just proud to be her mom," she told The Post. "Her work ethic is tremendous. She can procrastinate at times, but whatever she sets her mind to, she will do it." 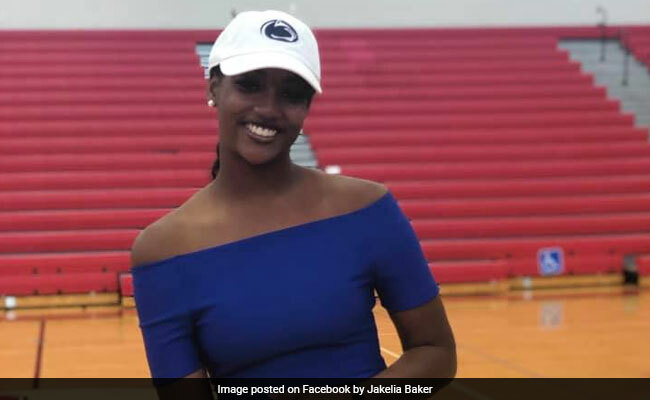 Jakelia said the hard work, the payoff - and national media attention - have taught her that "there is no place too small to be discovered" and that parents, teachers and friends will do their part "to help you succeed, as well."